Our Guided Group Walking Holidays are great fun and offer the opportunity to walk with others who appreciate the peace and beauty of the Spanish countryside. Our Guides are British but live and work locally and will be able to tell you about the terrain, culture and lifestyle of their communities. 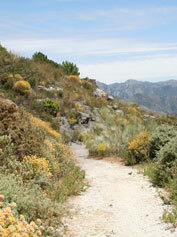 We offer 3 different Walking programmes. All of them include walks on 5 days with a free day - usually midweek. Group sizes are kept small; typically around 8 - 16 people so early booking is advised. Our most popular programme is our Multi-level week. This offers a choice of 2 walks each day. A full day level 2 walk or a shorter level 1 walk. You can decide each day which walk you want to do. These weeks are particularly suitable for partners or groups of friends who like to walk at different levels. On some of the walks, both levels walk together for a stretch before continuing on their respective routes. Whichever level you choose, we try to ensure that everyone enjoys their walk at their own pace. 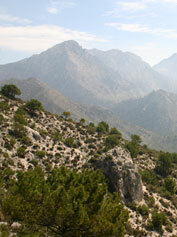 Our guests often return year after year which we hope says more than we can about the quality of our Walking holidays. Each day there is a choice of two walking levels..
What is a Level 1 walk? We walk for 3 - 4 hours each day and the routes have ascents / descents of no more than 300metres (approx 1,000ft) Ascents are gradual with no steep gradients and no difficult terrain. The pace is easy with frequent stops for photos or to look at wild flowers or birds. There is time left over in the week to read a book from our library, enjoy a massage treatment or just relax around the pool. What is a Level 2 walk? We walk for 5 - 6 hours each day and walks include ascents / descents of up to 700 metres (approx 2,000ft.) There is the occasional steep section but no scrambling or climbing involved. The walks are all suitable for people with a general level of fitness. On some dates we offer a level 1 week only or a level 2 only - but most of our Walking weeks are run as multi-level. If you are not sure which level will suit you - we advise you to book a multi-level week so that you can try both types of walk. What does your Walking Holiday include? 7 nights accommodation in a spacious air-conditioned room. Full board (except lunch on the free day). Guide fees and any transport needed to get to the start of walks. Free Airport transfers as long as your flight arrives at a time to meet our transport. Normally 12 noon and 15.30 from Malaga airport. Return transfers will drop you at Malaga airport by 9am or 13.00. Private taxis (up to 4 pax) cost 70€ each way and can be arranged to meet flights arriving at other times. Each day, after breakfast, your guide will lead you from the hotel for your day's walking. 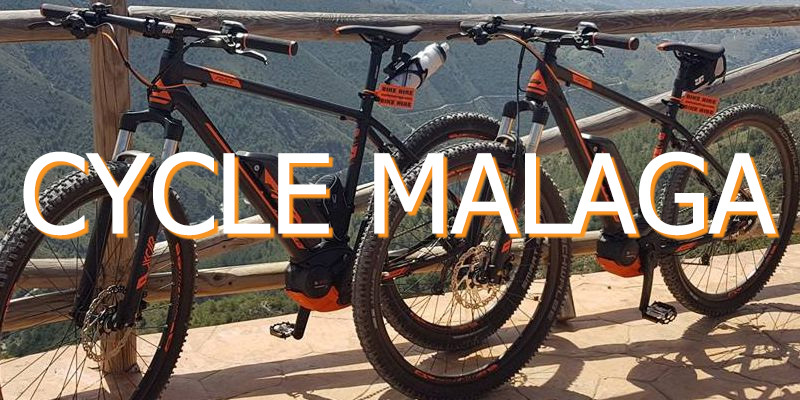 Walks follow mule tracks and ancient trade routes including part of the old silk route that originally went all the way to the Moorish imperial city of Granada. At the end of a rewarding day's walking you will return to enjoy the unique atmosphere of Finca el Cerrillo which has been carefully restored to combine the charm and character of old Andalucia with high standards of comfort. Rooms are spacious with air-conditioning and central heating. In the lounge and dining areas, a blazing log fire and a delicious dinner will be waiting for you and the 'honesty bar' will be at your disposal! Finca food is freshly prepared by our own chef and is consistently rated as 'Excellent' by our guests. On 2 or 3 evenings, dinner is taken at a good local village restaurant with transport provided to and from the door. Non-walking partners are welcome. We can arrange treats such as massage and refelxology as well as activities such as bird watching or horse riding, if required. Alternatively, non-walkers may choose to just relax and enjoy the peace and beauty of the hotel gardens, pool and library.